Many of us change our diet to lose weight, watch our salt to lower our blood pressure, and take medication to help with cholesterol because we know that heart disease and stroke are two of the leading causes of death for adults in the U.S. But we rarely think about, let alone change our driving habits to make driving safer. Yet car accidents, which claim the lives of more than 30,000 Americans each year, are also amongst the leading causes of death. Fortunately, even though we aren’t thinking about how to be safer drivers, other people are thinking about how to make driving safer and their efforts are making a difference. These are the people who work in the area of crash test science which uses crash test dummies to learn how car accidents affect the human body so that cars can be designed to provide more protection. According to the National Highway Traffic Safety Administration (NHTSA), efforts in this area have helped to decrease the number of fatalities from 23 per 100,000 licensed drivers to 16 during the 15 year period from 1994 to 2009. So, how does crash test science help make you safer? The use of crash test dummies in one form or another started early on in the evolution of the car. Car makers realized that in order to make cars safer, they needed to understand what happened to the occupants of the car when collisions occurred. In the first half of the 20th century, cadavers and pigs acted as crash test subjects, allowing car makers to see the types of damage caused from things hitting bodies and from bodies impacting other things. While this was helpful, it didn’t show the other kinds of damage that collisions cause like those resulting from gravitational force and kinetic energy. It was also impossible to conduct standardized testing. Then, in 1949, came Sierra Sam, the first real crash test dummy. Sierra Sam was originally designed to test what happened when a person was ejected using an ejector seat in an aircraft. From Sam, crash test dummies have developed into very sophisticated pieces of equipment that can cost as much as $400,000. 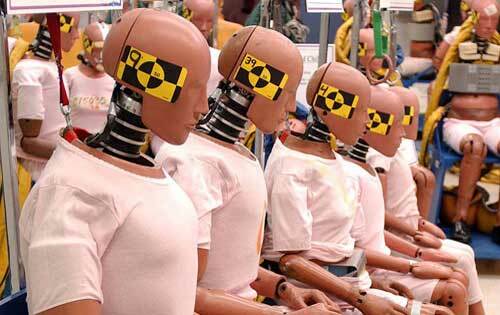 Crash test dummies allow for standardized tests to be conducted across multiple vehicles and different scenarios. This enables car makers to learn how to make cars safer and to test changes to ensure changes actually improve safety in the ways they expect. As long as there are cars being driven by people, there will be accidents. This means that making crashes more survivable is the key to further decreasing the fatality rate. Survivability goes beyond keeping people inside the car and keeping the passenger compartment intact, although improvements in these areas have dramatically increased the safety of our cars. This is where crash test dummies and the data they provide make a real difference. Gaining a real understanding of the kinetic energy a body is subjected to during a collision enables car designers to design cars in ways to reduce those effects.